CHELSEA — Walk into Vinegar Hill House in Vinegar Hill, Lodge in Williamsburg, Freemans on the Lower East Side and LIC Market in Long Island City and you’ll see the same thing — reclaimed wood beams, exposed brick and, if you're lucky, antlers. But some in the design field say the farm-to-table movement's earthy aesthetic has become, in some circumstances, “a tired hipster cliché” — opening the door to a new twist: Nordic chic. “I think we’re kind of going to stay there for a while with the communal tables and the space being a real blank palette for the food." Zorn pointed to acclaimed Williamsburg restaurants Luksus and Aska as examples of the cleaner, more Scandinavian take on urban rustic. Chef and owner of Luksus, Daniel Burns, explained the idea behind his restaurant's design. "The thinking behind it was, in essence, Brooklyn meets Scandinavia aesthetically," he said. “You’re seeing a lot of 'spare' rooms — even in the city with Contra, which is a tasting-menu-only restaurant. It’s not Scandinavian in any obvious way but still it’s working with two to five esoteric ingredients and changing them every night. They’re really envisioning the food as theater and the space just needs to be a real clean palate around it,” Zorn said. Jun Aizaki of Crème Design has designed the interiors of Red Farm's West Village location, Danji in Hell's Kitchen and Lugo Caffe in Midtown West. 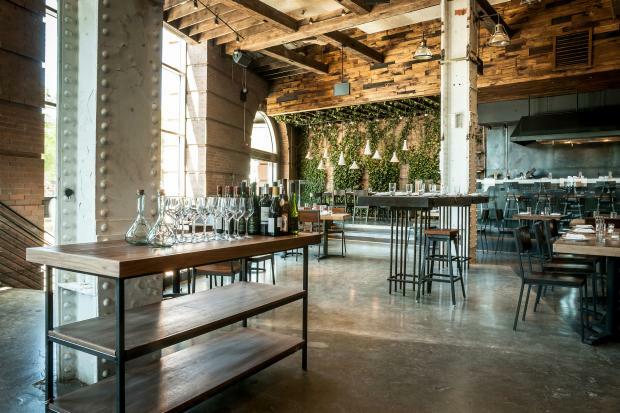 While every restaurateur wants something different, he said there are certain elements of the urban rustic trend that appeal to all establishments. At Chelsea's Toro NYC, interior designer Chris Kofitsas helped the newly opened restaurant embrace both the urban rustic look and the chef’s table — a place where large parties dine on a menu that the chef sets. "I do think it’s going towards ‘less is more,' simpler, slightly more refined in the look and materials but not over designed," she said. "We’re definitely doing a lighter palette, more of the bleached wood and light whites. We’re keeping it more airy, less produced-feeling, not heavy woods. "With farm-to-table there’s the idea of clean eating, which is very popular and so the surroundings need to reflect that."